How are flat fee MLS listings different from FSBO or For Sale By Owner? Most of you have heard of For Sale By Owner listings or FSBO. If you have, you understand that selling a home without a real estate agent means you have more control over negotiations and save thousands in listing agent commission. 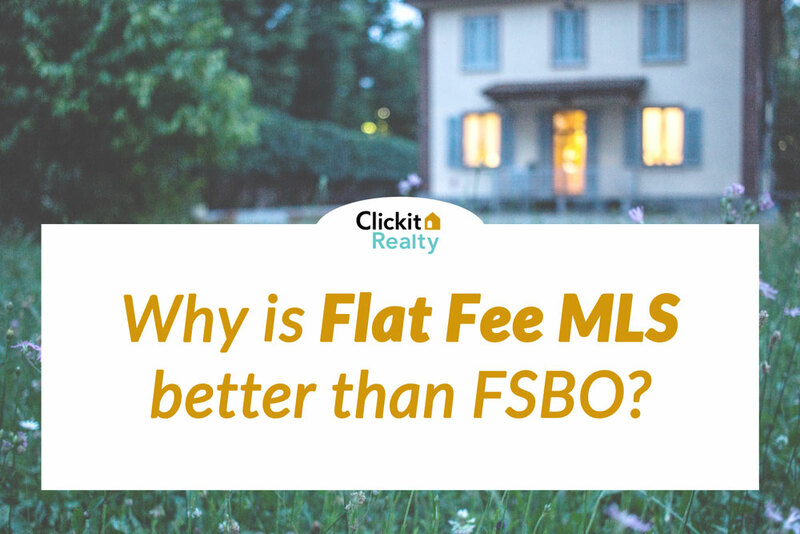 So, why are flat fee MLS listings better? 9 out of 10 homes are sold on the MLS. This is the listing service which real estate agents use to view homes available for sale and share them with their buyers. Your home would appear on the MLS as a listing provided by Clickit Realty Inc, but all of the leads from the listing are sent to you, the seller. Clickit Realty will act as an intermediary to list your home where For Sale By Owner listings cannot appear. Learn more about how Clickit Realty listings work here. We only sell real estate! We do not work with buyers unlike some low commission real estate agencies, who will list your property, but send buyers to full commission listings. Clickit Realty is truly a flat fee real estate provider. Clickit Realty provides advanced listing services compared to FSBO options at reasonable prices (listing packages from $279). You save 3% over listing agents and up to 6% if the buyer is not represented by an agent. Around 80% of buyers start searching for a home online, before ever contacting a real estate agent. Most FSBO homes are sold because the buyer saw a sign in the yard. Not true with Clickit Realty flat fee listings! Our listings are sent to dozens of popular websites, including Trulia, Zillow, and Realtor.com. By placing a sign in your front yard, you limit your audience by hundreds of thousands of potential buyers! Since your listing would also appear in the MLS, agents will share the listing with their clients bringing you maximum exposure. Typically FSBO homes are sold for $65,000 less than those listed by agents, this has to do with two major factors exposure and pricing. Our staff are experts in selling real estate and will help you with any questions you may have about listing your home including choosing the right price. We also provide the closing paperwork you will need. Further customize your listing package to include a secure lock box and agents can give tours of your home without having to exchange keys. Other great options include professional photography, a home warranty, and brochure boxes. Listing your property with Clickit Realty means you will save thousands, your listing will be viewed by thousands, and you have all of the control! If you have any questions please contact us. We encourage you to click the link below to view our available packages according to your state.